Ash Away Chimney Service - Why Do I Need A Chimney Sweep for my Jacksonville, FL, NE Florida or SE Georgia chimney? for my Jacksonville, FL, NE Florida or SE Georgia chimney? chimney fire, where the actual walls of your chimney flue are on fire. Chimney fires burn at over 2,000 degrees and can easily spread to the rest of your house. You need a chimney sweep to remove the creosote from your chimney flue. 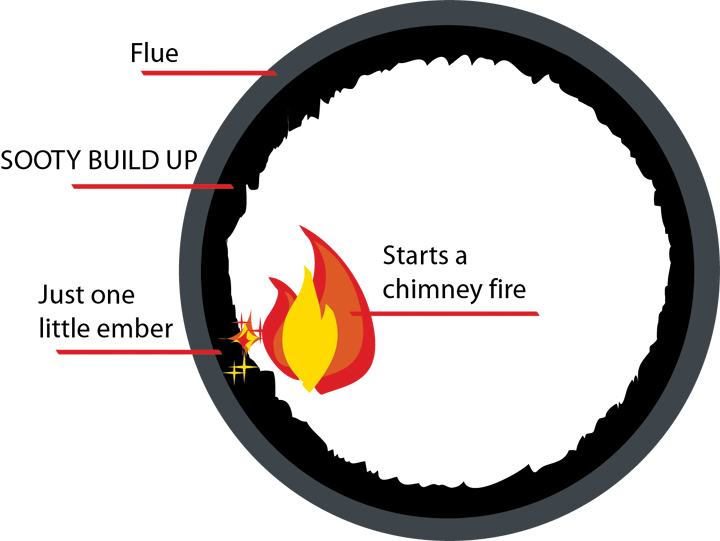 Chimneys and pipes like the ones on wood stoves are designed for smoke to pass through at relatively low temperatures; they are not built to withstand chimney fires which can burn at 2,000 degrees. A chimney fire can collapse a masonry chimney by destroying the mortar. In a pre-fab chimney the high heat can cause the metal to warp or separate allowing the fire to spread to the rest of your home. Soot build up in your chimney also reduces the flow of air out of the chimney flue and the chance of smoke coming back in the house is increased. Soot that is left on the walls of your chimney flue after extensive use hardens into extremely flammable and corrosive third stage creosote. Only a chimney sweep can remove the soot from the chimney flue. Even in Jacksonville, FL, NE Florida, and SE Georgia where chimneys are not used as often soot can build up in your chimney flue over time and one spark can cause a chimney fire that can start a house fire. For safety's sake have a chimney sweep clean and inspect your chimney and fireplace every year. Besides cleaning your chimney a chimney sweep will also perform a chimney inspection. It is good to have the condition of your chimney checked every year by a chimney sweep to make sure your chimney is in safe condition and that the top seal of your chimney is in good condition to protect your home from the elements. The chimney sweep will be checking to make sure that your chimney is safe for burning fires, including if your chimney needs a chimney sweep. If your chimney doesn't need a chimney sweep Ash Away Chimney Sweep will not perform a chimney sweep and will not charge you for the chimney sweep, only for the chimney inspection. The chimney sweep will also check up on the roof and make sure that your chimney is sealed and secure from the elements. The chimney sweep is checking for rust and general deterioration on the chimney parts on top of your house to make sure there is no where on your chimney where water can visibly leak into your home. The chimney sweep will also check to see how energy efficient your chimney is. The chimney sweep will make sure that your chimney's damper properly closes your chimney and doesn't allow air conditioning to escape out of your chimney. An open, broken or missing chimney damper is like leaving two windows wide open. A properly installed chimney damper can save $30-$40 off your utility bill every month.